My first collection DEMONS, FREAKS, AND OTHER ABNORMALITIES, originally released in 1999, is now available via ebook from Crossroad Press. All original 11 stories are included, as well as a bonus tale, the 7000 word THE CHICKEN MAN. Get your copy now for only $2.99. And while you’re there, download a copy of THE DEMONOLOGIST. This entry was posted on Thursday, December 30th, 2010 at 2:36 pm and is filed under Uncategorized . You can follow any responses to this entry through the RSS 2.0 feed. You can leave a response, or trackback from your own site. Hey Michael! 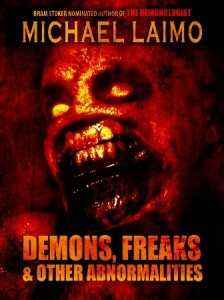 Awesome news about “Demons, Freaks & Other Abnormalities.” I will definitely be buying a copy soon as I get paid!